Most doctors in America in the nineteenth century were educated by apprenticing themselves to physicians. A relative few actually attended so-called medical schools, usually run by a small group of practicing physicians who gave lectures in return for fees. Apprenticeships and school courses might last months or a year or two, and seldom required even college education as a prerequisite. Women were seen as homemakers raising their children and keeping house. It would be especially shocking for ladies to attend classes such as those dealing with subjects like human anatomy or sexually transmitted diseases. A few male physicians, especially Quakers, who had always promoted gender equality, would allow women to apprentice with them. Proprietary schools occasionally admitted a woman, especially toward the end of the century. Most of the proprietary schools disappeared or merged with newer schools as the transition to the modern university medical school occurred between 1885 and 1925. At the middle of the 1800s women began to enter medicine. The first to graduate with an MD, in this county or in the world, was Elizabeth Blackwell in 1849 in Geneva, New York. After this historic event, medical education became open to women especially through sectarian schools of medicine and through the establishment of women’s medical colleges. This history of women doctors in Indiana is sort of hidden in the shadows, as medical licensing did not take place in the state until the 1890s, and the names of those licensed are not always clear as to gender. For instance, many doctor’s names are only given as the last name preceded by initials, or some names are not gender specific, such as Leslie, for instance. Still, what we do know, is that women practitioners were not very numerous. Only three were known to have practiced in the 1850s, three more in the ‘60s, and less than twenty by the end of the century. We will look at a few of the more memorable of these women medical doctors in the rest of this posting. Mary Frame Myers was born to Quaker parents in Bucks County, Pennsylvania, in 1816. In 1833, they moved to New Lisbon, Ohio. In 1839, she married Dr. Owen Thomas who became her instructor in medicine. She received a medical degree at Penn Medical College in 1856. At first she was not accepted by all-male medical societies but later in the century became a pioneer woman in them. Her medical career involved work with the poor. She was active in many charitable organizations and was a proponent of women’s rights and suffrage. The Thomases had three daughters. She was described as a model wife and mother. She not only attended to the usual household chores, at a time when there weren’t any labor saving devices, she also made all of her children’s clothing by hand, all the while practicing medicine, as well as writing and lecturing on medical and social issues of the day. She and her husband first lived in Fort Wayne. She was twice refused admission to the Allen County Medical Society because of her gender. They then moved to Richmond, Indiana, where she was admitted to the Wayne County Medical Society in 1875, and was later an officer of that society. She had been admitted to the state organization in 1876 as its first woman member and also became a member of the American Medical Association. She gave a speech to the Indiana Senate in 1859 urging property rights for women and amending the state constitution to allow women to vote, but the legislation she proposed was not enacted. She edited and published a women’s rights paper, The Lilly. Among the causes for which she worked were the establishment of a separate state prison for women, the presence of women physicians in state mental hospitals, and a separate reformatory for girls. Dr. Mary Thomas died August 19, 1888, in Richmond, at the age of 72. Sarah Stockton was born in 1842 on a farm near Lafayette and later operated the Stockton House hotel in Lafayette with her sister after their parents had died. She graduated from the Women’s Medical College of Philadelphia in 1882. Her thesis for the M. D. degree had been on the topic of “Insanity.” She returned to Indianapolis to practice medicine in a private practice and at the hospital for the insane. At the time of her appointment, she was one of only twenty-two women physicians working in eighteen state hospitals in nine states. The New York Times, December 7, 1883, reported that her appointment was the first official recognition of a female physician in the history of Indiana. Dr. Stockton was also, at one time, the physician in charge at the Indiana Women’s Prison, Indianapolis. After her earlier work at the hospital for the insane, she later served there full-time as a physician for twenty-five years until her death in 1924. Mary Spink was born in Washington, IN, 1863. While she was serving as a nurse at the hospital for the insane, Dr. Fletcher, the director, encouraged her to enter medical school. 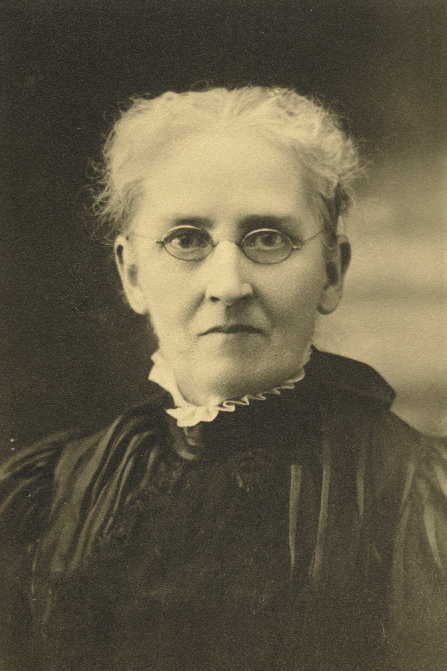 In 1887, she became one of the first woman graduates of one of the schools that would later merge to become Indiana University School of Medicine. She served as a pathologist at the hospital for the insane and developed a system for preserving circulation within the skull that was considered a significant contribution to the field of neurology. For a time she was a surgeon at the Indianapolis City Hospital. She later took a post-graduate course in nervous and mental disease in New York City. Dr. Fletcher left the state institution in 1888 and opened a private sanitarium, Neuronhurst. Dr. Spink joined him, and on his death in 1907, became head of Neuronhurst. She specialized in psychiatry and neurology. In her capacity as a physician at the sanitarium, she would have also attended to the general medical needs of patients. She was a close friend of the family of Vice President Charles W. Fairbanks, of Indianapolis, and a frequent visitor at the White House at the time that Fairbanks was Vice President and Theodore Roosevelt was president. She was a member of local and state medical societies and of the American Medical Assocition. Active in civic affairs, she was considered among the “most respected and beloved citizens” of the state. She died in 1939, age 75. Eva A. Cropper, who was born in 1854, was one of the pioneering women physicians of Indianapolis. She had been one of the first female students of Fort Wayne College of Medicine, graduating in 1883. She became a general practitioner immediately, making house calls by horse and buggy. Initially, she practiced in Elmore, Ohio and Sheridan, Indiana before moving to Indianapolis where she practiced for more than forty-five years. In the later years of her practice, she specialized in the diseases of women. She died, at age 82, in 1937, survived by a daughter, a grandson, and two great grandsons. 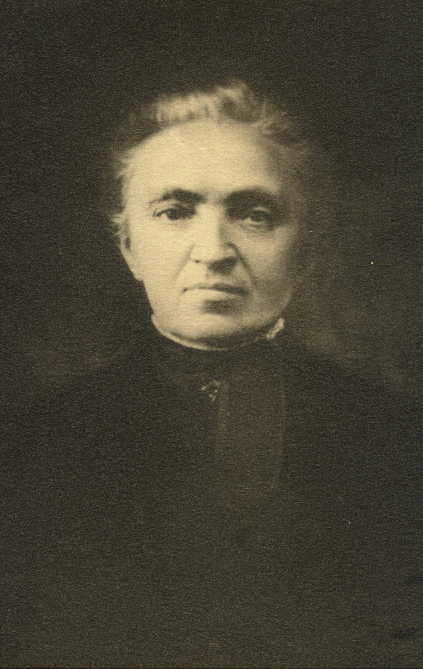 Mary Anna Elson was born in Würtzburg, Germany, in 1833. She graduated from the Women’s Medical College, in Philadelphia, in 1858, the first Jewish woman to do so. She practiced in that city at first as well as giving lectures on medical topics. She later practiced medicine in Goshen, Indiana. Dr. Green was born in Vermont in 1843. When she was a child, her parents moved to Detroit, Michigan where she received her early education. Her father was a doctor, and during her school days she began a course of reading in his library. She “clandestinely” attended lectures at Rush Medical College in Chicago. She stayed in a hiding place next to the classroom, but was eventually admitted to the classroom due to her intense interest and scholarship. She then enrolled in the Keokuk College of Physicians and Surgeons, Keokuk, Iowa, graduating in 1884. She practiced briefly in Yorktown, and Princeton, Illinois, finally settling in Fowler, Indiana. Dr. Green was a family physician and surgeon, but particularly attended to women and children. The Journal of the Indiana State Medical Association noted that she had died in September, 1941 at age 98. 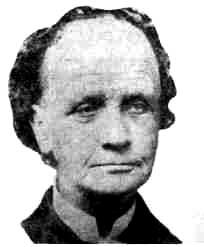 Martha Hutchings was born in 1842. As a young woman, she studied for two years with a physician in Vernon, Indiana. She then attended Women’s Medical College, Philadelphia, graduating in 1870, and interned at the New England Hospital for Women and Children, Boston. She practiced for about a year and a half in Madison, Indiana before marrying Dr. Thomas Griffith who was a member of a family of physicians. They both practiced in Darlington until 1888 when they moved to Crawfordsville. Dr. Griffith specialized in diseases of women and children, and was considered a pioneer in the field of Public Health. 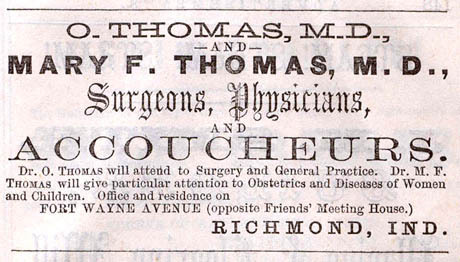 The Montgomery County Medical society was founded in 1872 but did not admit women at that time. She became a member in 1880 and was later vice president of the society. Her husband was also a prominent citizen of Crawfordsville. Their son James became a physician and practiced in Crawfordsville. She was an ardent suffragist. In 1894, she and some other women went to the polls. They were admitted but not allowed to vote. They returned later with her lawyer. He took the case to court, but their petition was denied. Dr. Griffith practiced medicine until she broke her hip in 1923. She died in 1924, in Crawfordsville, at age 82. Maria Allen was born in 1846 on a farm near Fairfield, Indiana. She received her early education at the Fairfield Friends School in Camby and the Academy in Spiceland. She taught for twenty years in one room school houses. At the age of 38, she began the study of medicine, graduating from Northwestern University Women’s Medical College in 1887. Soon after, she married widower Joel Jessup, a dairy farmer and businessman. She maintained a medical practice in Hendricks, Morgan, and Marion counties for thirty years until reasons of health forced her retirement. She had an office in her husband’s home in Friendswood, but she made housecalls, day or night. She continued to practice medicine until 1914. Her husband died in 1908, and she died in 1921. Fannie McClelland was born in 1841. She graduated from Eclectic Medical College in 1875 and practiced in Crawfordsville, Lafayette, and Franklin. In 1888, she married a farmer, James Rich, and subsequently ran a boarding house in Crawfordsville. 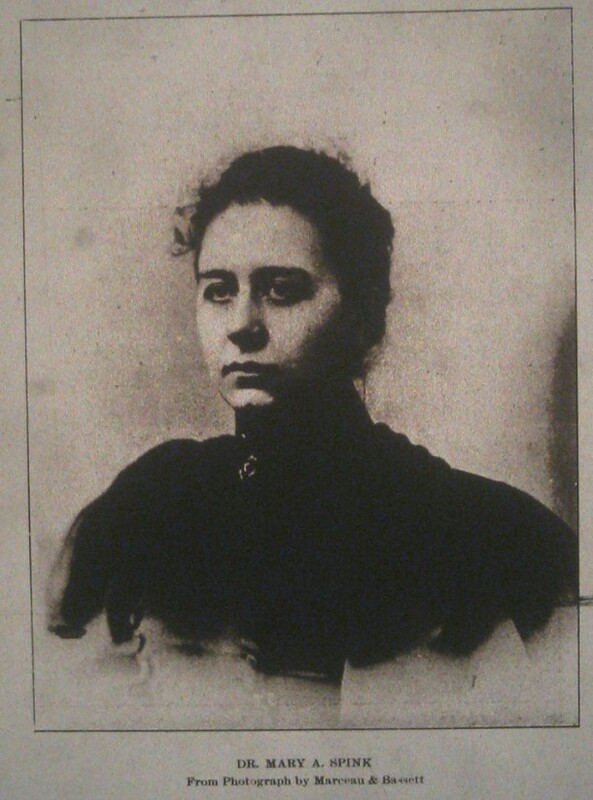 Hannah Rous was born in Switzerland County in 1854 and graduated from Vevay High School. After attending Moore’s Hill Normal School, she taught for several years in order to save money for medical school. In 1886, she graduated from the University of Michigan, School of Medicine, one of the pioneering schools in modern medical education. She practiced medicine in Vevay until her final illness, cerebrospinal meningitis, and died in 1905. Elizabeth Schmidt was born in Germany in 1826. She practiced midwifery in Indianapolis for more than twenty years. In 1880, at the age of 54 the completed the two year course and graduated from Central College of Physicians and Surgeons in Indianapolis. She retired at age 70 and died in 1904 at age 77. Sarah Fowler was born in Lagrange County, Indiana, in 1841. She attended public schools and later the Wolcottville Seminary. Sarah married James Stockwell of Lagrange County in 1857. She did not decide to attend medical school until she was thirty years old in 1870, and had to sell most of her worldly goods to afford it. She graduated with honors from the University of Michigan, School of Medicine in 1876 and began practicing pediatrics and gynecology in South Bend, Indiana, developing new surgical procedures. She died of uterine cancer in 1904 at the age of 63. Mary Holloway was quite possibly the first woman in Indiana to graduate from a medical school. [Both she and Mary Thomas are recorded as having graduated from Penn Medical College in 1856.] She was the daughter of pioneer settlers, born near Crawfordsville in 1831. Because she had few financial resources, her plans to become a physician involved earning money as a country school teacher and a seamstress. When she had a few savings, she applied to Penn Medical College, in Philadelphia, beginning there in 1854. Edgar Thomson, one of the founders, became interested in Mary Holloway and gave her money from a fund for needy women students. She graduated in 1856 in a class in which there were twenty-six other women. She returned to Crawfordsville to practice, and four years later married Eleazer Wilhite. He had a tailoring shop and was an accomplished violinist and flutist. They had seven children, three of whom died in infancy. She was especially interested in the welfare of young girls, and helped many of them obtain employment. She was also concerned at the condition of the children of adult paupers, eventually establishing the county children’s home. She died in 1892, at which time there were twenty-six physicians in Crawfordsville. Three of them, including Dr. Wilhite, were women.